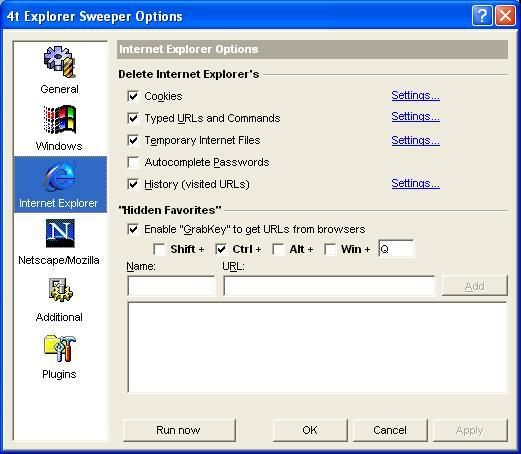 4t Explorer Sweeper clears browsing history such as cookies, temporary Internet files, index files, recently accessed files, URL`s, search terms, passwords, etc. It also speeds up PC performance, increases free disks space and improves security by clearing the content of various Explorer and Netscape folders. In its `System Tray` mode it runs in system Tray as icons and helps to free up space on your taskbar. In `Invisible` mode application is not possible to see even in the system Tray, but it still can run automatically every several minutes (you can still activate Options by clicking the special `Options` link in your `4t Explorer Sweeper` Start menu section). - `AutoKill` mode. The program now can monitor opened browser windows and run automaticallywhen the last browser window will be closed.